A few weeks ago, we went with our friends Jamie and Cortney to Central after seeing comedian Aziz Ansari at the Warner Theater. We attended the early show (which started at 7pm) and planned to have dinner afterwards. 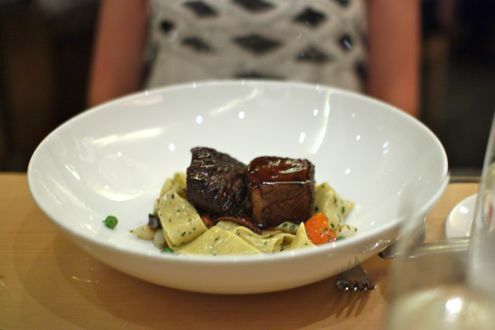 Given the proximity to the theater as well as having never been to one of Michel Richard’s restaurants before (at least for us), Central was an ideal destination. After what was a hysterical performance by Mr. Ansari, we made our way down 11th Street for our 9pm reservation. The restaurant was very busy for a late Friday night, but then we also realized that it’s near several hotels as there were a lot of US Open attendees in the house. 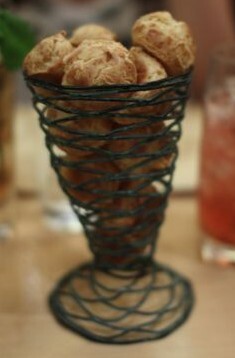 Cortney suggested that we order the famous gougères, or cheese puffs, to share amongst the table. 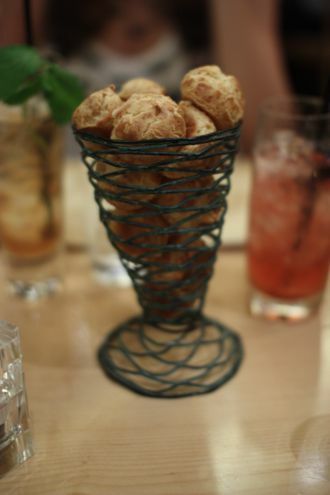 It turned out to be an excellent suggestion as the gougères were warm, moist, and delightfully cheesy. Granted this was my first time indulging in this French pastry, and it proved rather difficult to resist hording them for myself after devouring a couple of them. After deliberating between the fried chicken with mashed potato and roasted pork loin with flageolet beans, I ultimately opted for the former after asking for the waitresses’ recommendation. 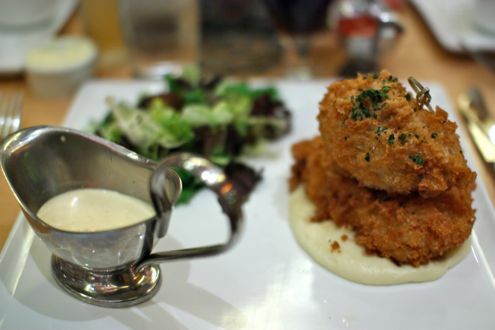 In fact, the restaurant’s famous fried chicken is the most frequently ordered item on the menu. Rachel and Jamie went with the lobster burger, while Cortney ordered the short rib with pappardelle. The fried chicken turned out to be a great choice. 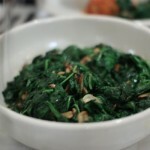 On the plate was a thigh and breast atop a serving of mashed potatoes along with a side of greens. The waiter also served a bowl of mustard sauce which I sparingly used (a little too rich for my taste, but good nonetheless). While the breading was crunchy and flavorful, it fell off the meat rather easily. It was also a tad on the salty side, especially when it was paired with the mashed potatoes, but the chicken was incredibly moist and juicy. What was most amazing was the lack of grease. I’m not sure if it’s the best fried chicken I’ve had in DC (Birch & Barley’s chicken and waffles comes to mind), but overall I was very pleased with my entrée. Rachel loves all things lobster, and the lobster burger is right up there with the fried chicken in regards to famous dishes at Central. While she winced at the steep price of $30 for a burger, she was confident that this would be no ordinary plate. In other words, the burger was amazing. 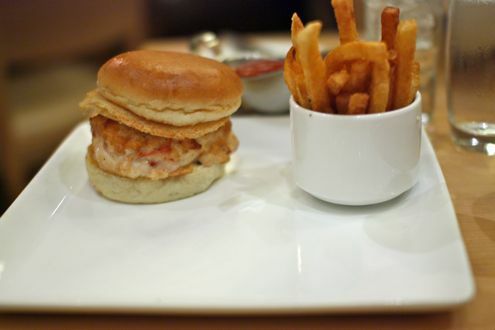 She once had a shrimp and lobster burger at The Capital Grille, but Central’s rendition was simply pure lobster meat formed into a patty and then grilled. 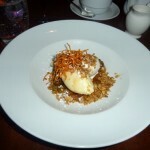 It was served on a warm bun and topped with a parmesan crisp, which added a nice crunch to the sandwich. The lobster was incredibly juicy as she was very happy with her selection. The fries were good, but not outstanding, and while she could tell that they were going for simplicity on the plate, for $30 it seemed a little barren. I mean, could it hurt to add an accompaniment like pickles or some greens? 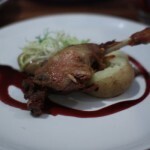 All and all, all four of us had a superb dinner at Central. While we can finally check off this well-renowned DC restaurant off our bucket list, it doesn’t necessarily mean it will be our only visit. I for one would love to try the tartare of filet mignon, and even more importantly, Michel’s chocolate bar. On another note, this post is making me hungry.